The lunar eclipse has also been labelled a “wolf” Moon has been attributed to the Native Americans’ name for January’s full Moon. The Moon will lose its usual white hue and turn an red-orange colour due to sunlight passing through the Earth’s atmosphere is bent towards it. The early Native Americans didn't record time using months of the Julian or Gregorian calendar. Instead tribes gave each full moon a nickname to keep track of the seasons and lunar months. Tonight’s eclipse is also a “super moon” which is when a moon appears 30 percent brighter and 14 percent bigger to the naked eye. This happens when a full moon is at the point in its orbit that brings it closest to Earth. If the skies are clear, the entire eclipse will also be visible in South America, as well as Greenland, Iceland, Ireland, Norway, Sweden, Portugal and the French and Spanish coasts. The rest of Europe, as well as Africa, will have partial viewing before the moon sets. Asia, Australia and New Zealand will miss out. 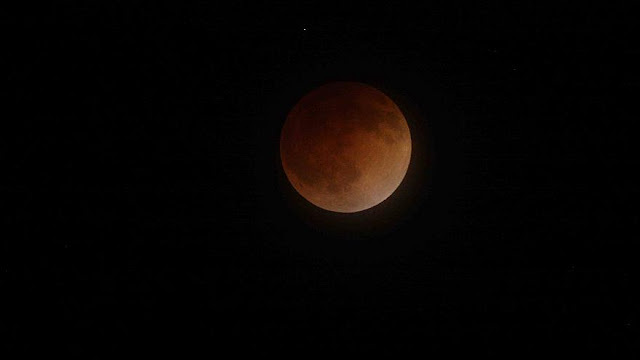 At 11.41pm (Eastern Time), the moon will enter totality and turn completely red as it is devoured by Earth’s umbral shadow. It will stay this way for about one hour, and at 12.12am. on Monday, it will reach the darkest part of Earth’s shadow, appearing to be at its most coppery red.